Nearly half of readers pass along their copy of Passenger Transport to a colleague. 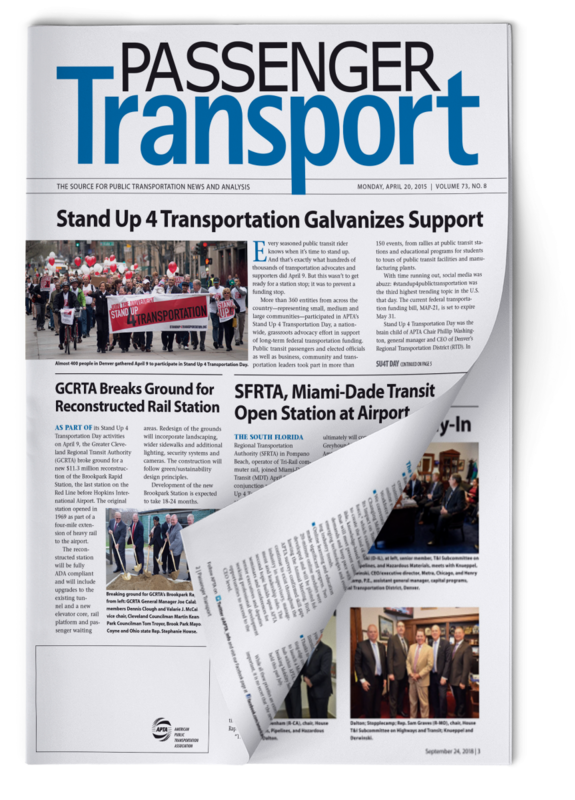 Passenger Transport, the flagship publication of the American Public Transportation Association (APTA), is the leading publication for public transportation industry news and analysis. Now in its 77th year of reporting on the public transportation industry, Passenger Transport is the publication that public transportation executives, policy makers, elected officials, department heads, managers, and employees have come to depend on. Published bi-weekly, Passenger Transport's mission is to provide readers with timely and useful news and information about the events, trends, and issues that affect public transportation. A superior editorial platform, an influential readership, and cost-effective pricing combine to make Passenger Transport advertising opportunities far and away the best marketing avenue to reach public transportation industry buyers. Nearly 85% of Passenger Transport readers consider it a must-read.